One of the things that impresses me most about my Juki is it's speed. So I decided to do a speed test on it and the best way I thought to do this was to do a little quilt as you go bag. I cut a piece of batting roughly 25X25 (the bag didn't end up this big!) and started out. Now way back, when I made this quilt, each square took about 2-3 hours and they were only 14.5" squares. The end result was, quilting a 25 inch square on the Juki took me about 3 hours (I get pretty wound up in fabric selection so this took most of my time!) compared to 2-3 hours for a 14.5" square. I have to say, I'm pretty happy to be able to quilt something 3 times as big in the same amount of time! And if you haven't entered your name suggestion for my Juki yet, bring it on! There's still time! I could not love this more! This bag is fantastic!! Love it to pieces! I'm curious, could you tell me what the fabric is on the underside of the handles...the colored circles? I don't recognize it, but I love it. thank you so much, Jan! I'm pretty happy with how it turned out! That's the cool thing about QAYG, you don't know until your done what it will look like, but it always turns out fab! Oh man! You should sell this~to me!!! I adore it! 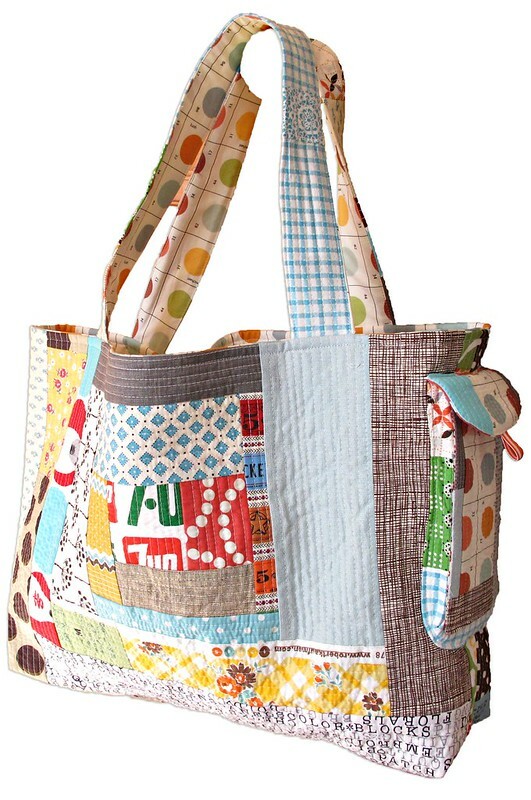 Is it okay with you that I pinned the photo of your quilted-as-you-went tote on Pinterest(with full credit/ attribution)? I love the combination of patterns as inspiration, but I also want to remind myself to use QAYG to make a tote bag since I've felt intimidated by the technique in the past and one can only have so many pillows. Please let me know if you would prefer not to have your work pinned and I will remove it from my board immediately. absolutely, Amy! Thank you for asking! I love your bag and I love the qayg pattern. After you made the 25x25 inch square did you then cut it into the sizes for your bag? approximately what size did it turn out to be?? I may have to use this as inspiration. The front and back QAYG bag panels are about 15X21, back and front sewn together, corners boxed to about 4 inches, lining sewn with same measurements as outside, hole for turning, straps QAYG and about 2" wide, and the pocket was just a happy mistake. I made the outside of the pocket and the flap and was just going to sew them on, but the pocket was too small for my phone so I added the gusset to the pocket, sewed it onto the bag and then sewed the flap on. I love all your fabric choices in this bag! Thanks for the info Penny. I really appreciate it. Enjoy your new bag and your new machine, she is a beauty. i really love this penny! i have been trying to decide between a juki and a janome horizon. i hope you do some more of these kind of posts to help me to decide... i am leaning juki, then i start leaning janome... just not sure. all i know is that i really want a much larger throat space! Wow, this is what you were cooking up! Just loving the little phone pocket on the side, what a great bag! good luck with your decision, Nicke! The dealer I bought it from sells both Janome and Juki and he said if you want a straight stitch only machine, the Juki is the best hands down. I love that large "D" area and cannot wait to quilt a quilt with it! So much room, so fast, and the stitches are perfect. Apparently since the thread goes in and out of the needle sideways instead of front to back, your stiches look more straight and don't go from side to side like other machines. it's adorable!! i'd LOVE to make a bag like that - love the idea! This bag is fabulous - I love it! How about a tutorial or pattern. I've never done QAYG! I want a Juki, too! 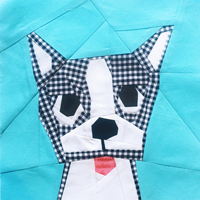 Hi Barbara, if you go to my patterns and tutorials link at the top of my blog, scroll down to the 4 part QAYG post and that should be the info you need for that part and then follow my instructions I have given as a reply up there in the comments and you should be golden! I won't be doing a formal tutorial however for the time being. this is so amazing penny. seriously, you make things look so easy!!!! love all your lovely fabric choices and that pocket, perfect!! thank you Anna, that's a huge compliment coming from you! it was a really fun bag to make, you could probably whip it up in 2 hours compared to my 7! Thanks for sharing the ins and outs of the bag! I hope you love your juki as much as AJ does. I bought a Brother PQ1500 for similar reasons. I love it and find it quilts like butter. :) of course you can Bobbi! I'm rooting for you! I'm enjoying her immensely! thank you! Ok, I know I suggested before, but how about Jukzilla. It's a monster for sure and I sure wish I had one! Green with envy is me. Love the bag Penny! I have had my basic Juki for a year now and it totally rocks, so fast! 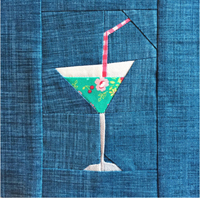 I love quilting straight lines on it. I can't help but put the petal to the metal when I sew on it, just often to see how fast she will rip through the project! enjoy your new bag! I had been away from blog world for a while and one of my friends emailed me and said I have to check your bag out! Now I know why! It is soooooo CUTE, Penny!! As always, I just love your log cabin style! Very cheerful and playful!! And it makes me so happy to see that you used the 7 up scrap like that! thank you Ayumi! And I only used a bit of the 7-up scrap you sent, just cutting off little pieces to make it last! I almost used some of the mr donut fabric too but decided I needed to pace myself, lol! 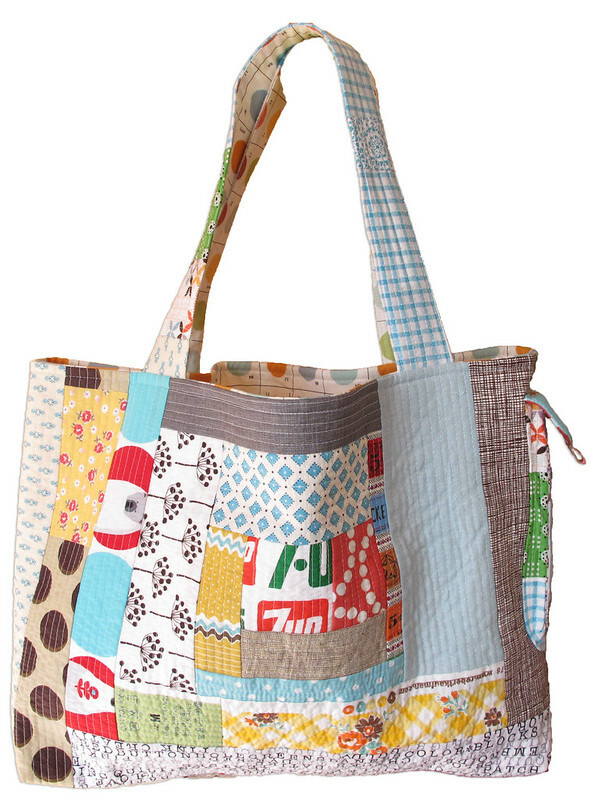 Love this bag and all your fabric choices, so cute! I seriously love this BAG!! it was super fun picking out the fabrics, Elsa! I love that part! I want to make this bag. Why didn't I do something last night instead of sitting in front of my sewing machine doing nothing? I could have this bag today! well hop to it, Nanette! Will you also share how to make a bag like that? Hello! A fellow Juki owner here to say that speed is my favorite thing about my juki! :) Her name is Janice --- now I'm about to go check out your post about names. :) Oh and your bag is fabulous!! I really like the side pocket...did you add that yourself? Do you have a tutorial for the pocket? I am so in love with this bag. Going to try to make my own today. Thanks for sharing the dimensions. I LOVE this bag. I see that there is a tut on quilt as you go but it there an actual tut on this bag? I need to know more about finishing the inside and such? Thanks so much for sharing. I'd love a pattern for this bag, it looks like something I could handle making. How and where can I find pattern please.